In a large saucepan of boiling water, cook 2 sweet potatoes with garlic for about 15 minutes, until soft. Mash with cream and half of butter. Salt and pepper, to taste. Keep warm. Reheat duck legs and remove meat. Keep warm. Cut remaining sweet potato into very thin rounds. In a large frying pan, melt remaining butter over medium heat and cook rounds on both sides until golden. Place a round stacking mould on each of 4 plates. Divide mashed sweet potato among moulds. 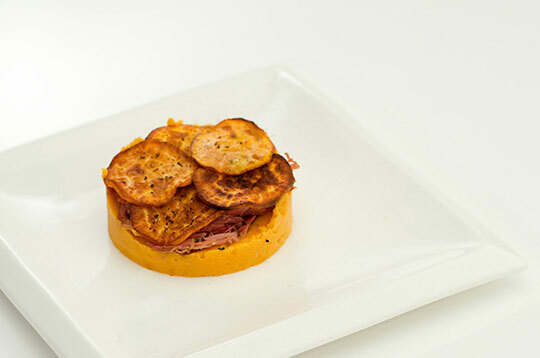 Top with duck meat then sweet potato rounds. Salt and pepper, to taste.Serve immediately. Note: You can use an empty food can with both ends removed, washed, instead of mould.